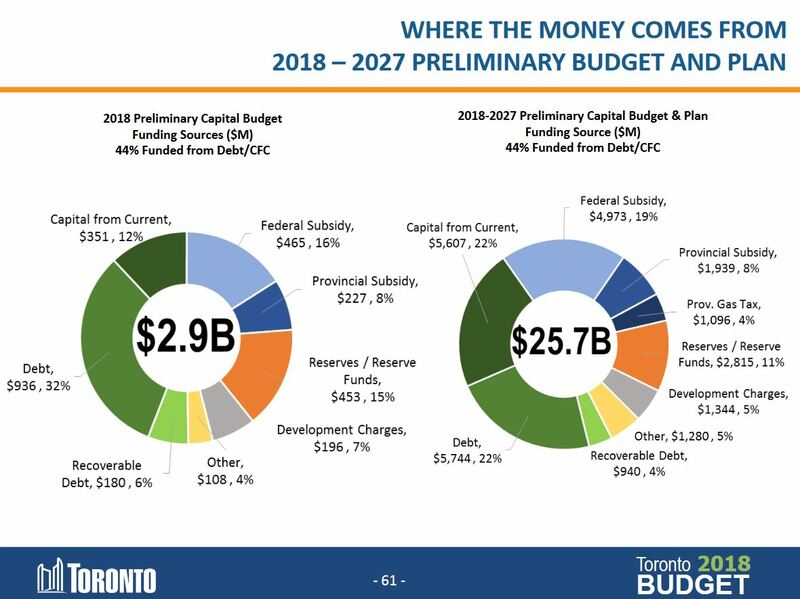 The preliminary City of Toronto operating and capital budgets were presented at Toronto’s Budget Committee on November 30, 2017. Although Council may approve many wonderful initiatives and the Mayor may hold many press conferences and photo ops exulting in the decisions, the money to pay for them is often not part of Council’s decision. What actually happens is that these are “nice to haves” thrown into the coming year’s budget hopper on the off chance funding will materialize by budget time. This has the effect of throttling the will of Council and feeding all of its decisions through the much more conservative outlook of the Budget and Executive Committees. Council further limits this process by passing a budget directive early in the cycle (usually late spring) directing that property taxes for the coming year not rise by more than the rate of inflation. The actual increase is below inflation because commercial property rates are on a long downward trend thanks to rules imposed by Mike Harris to rebalance the relative tax levels for commercial and residential properties in Toronto. This will not complete until, probably, the 2021 budget after which tax increases will apply equally across the board. policy directions such as rebalancing rates between property classes (e.g. commercial vs residential). Other new revenues can flow to the City through various rate structures notably TTC fares, although these have been frozen for 2018. A small increase in fare revenue is expected compared to the 2017 budget thanks to a changes in the relative number of fares paid of each type (passes, tokens, cash). As things stand today, the funding to pay for the Two Hour Transfer simply isn’t there, but it may be found, almost like magic, as the budget process unfolds from now through February 2018 at Council. Another transit fare proposal, the first phase of the “Fair Fare” scheme in the Poverty Reduction Strategy, is also not funded. This process creates a drag on implementation of new programs unless there is strong political support from the Mayor and his voting block on Council, and should serve as a warning to advocates for schemes such as the Ridership Growth Strategy. With luck, there will be proposals before the TTC Board before the hiatus of meetings for the 2018 elections, but anything the Board approves will be considered as an “enhancement” going into 2019 and could well be derailed. Add to this the chronic problems of vehicle and garage space shortages at the TTC, and there is a recipe for seeing little real growth in service until at least the 2020 budget year if not later. This is the combined effect of a process that has valued capping spending above all other goals for many years. Infrastructure that would be needed to support growth doesn’t exist and has a multi-year lead time, and even the vehicles the TTC owns run less service than they could because improving service never comes with enough revenue to cover costs. Passengers who have shorter waits or are less crowded do not represent extra revenue, and the marginal gain lies only with new fare-paying trips attracted to the TTC. On a grand scale this is seen for 2018 with the Vaughan subway extension where net new revenue does not come close to paying for the added operating cost of service, but this happens at a smaller scale whenever a bus runs more often and less crowded, but mainly with passengers who were already on the system. A further problem for constrained budgets is that the cost of existing service goes up through inflationary pressure, and the population requiring municipal services including transit continues to grow. City management use that growth to show how the tax burden is actually declining on a per capita basis from $4,480 in 2010 to $4,262 in 2018 (presentation, p 17), and this is considered to be virtuous when in fact it shows not just “efficiency” but also a decline in service provided. The effect on individuals varies depending on which municipal services they consume, and the program-by-program effect is never reported. Every year, the budget is hauled into balance through a combination of new revenues, reduced expenditures and “bridging”, a term for various accounting “fixes” that get the City past short-term problems. (Apologies for the subtlety of the colour changes in the chart below. It is from the City presentation.) Note that the values below are “deltas”, the change from year to year, not the total revenue or spending in each category. Expenditure cuts (darker blue) have been a large chunk of the savings in recent years. 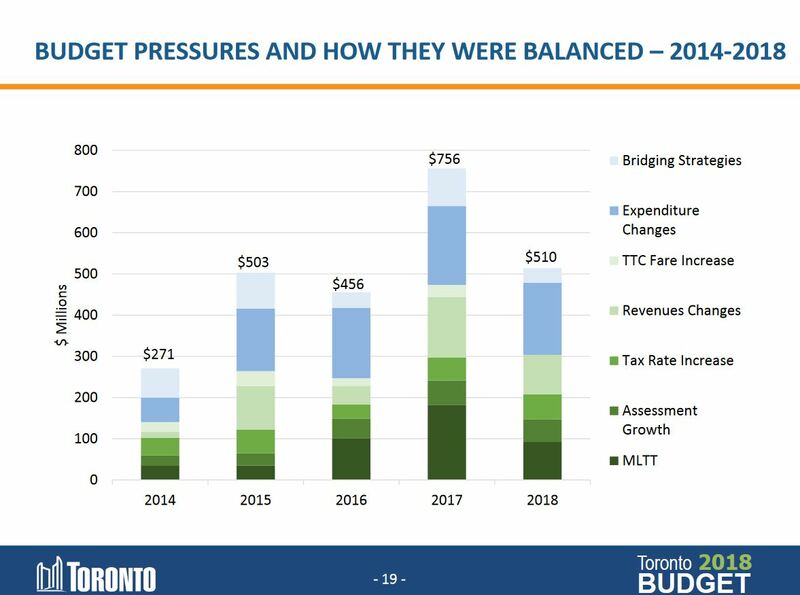 By comparison, TTC fare increases are small change within the larger City context and, of course, there is no increase in 2018, a policy direction endorsed during the 2017 budget cycle. However, City budgets are debated at the margin in that any fine tuning is achieved by tweaking revenue sources to accommodate new spending, and the proportional effect on thinks like fares, property taxes and other user fees tends to be higher than for the budget as a whole. The reason for this is that much of the City’s revenue comes from sources that Council cannot “tweak” in the course of setting its budget, and so the effect on what remains is higher. 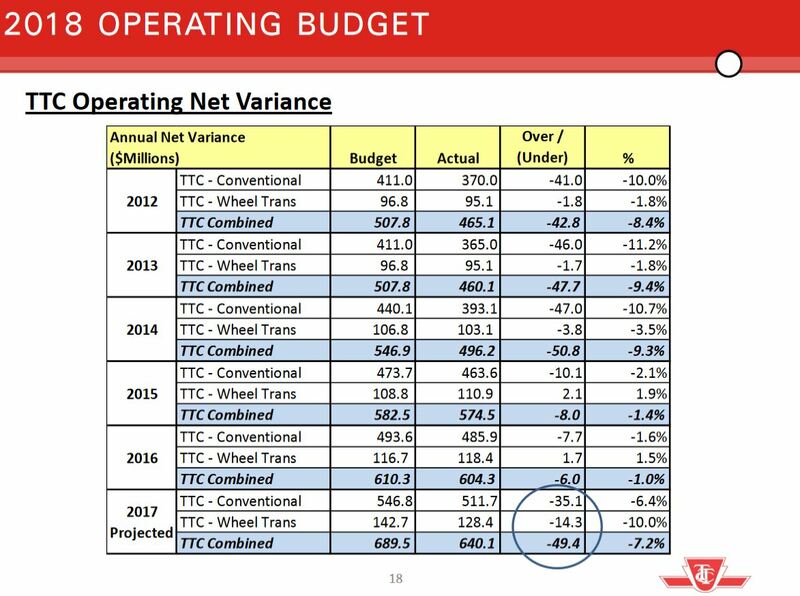 The TTC Board decided that it would include the money sitting in the Transit Stabilization Reserve as 2018 revenue, just as they did in 2017 (although in fact this was not needed because of better-than-budget results). 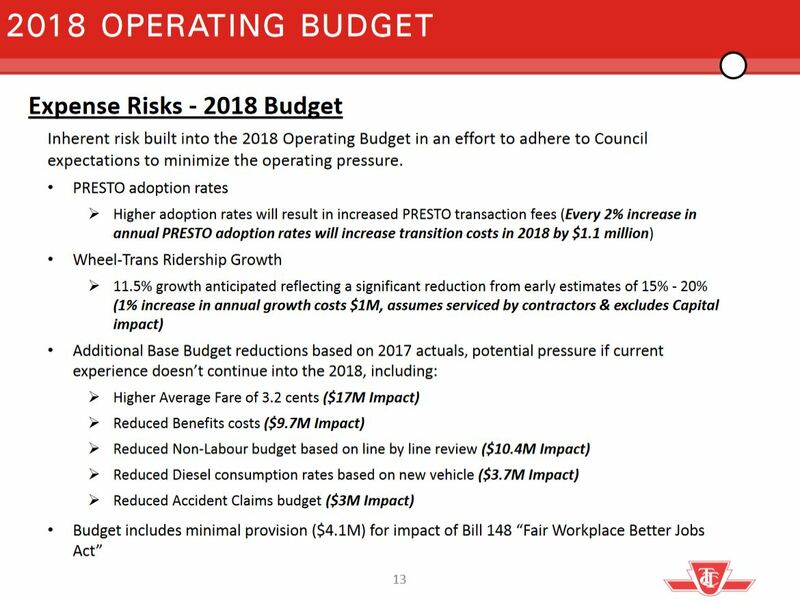 This keeps the year-to-year subsidy increase down to $24 million paying mainly for the new cost of the TYSSE and for transitional increases in fare handling while Presto and the legacy fares both remain in place. Using that reserve is an example of a “bridging strategy” because the reserve will not be available in 2019 if it is depleted in 2018, and new revenue will be needed to replace it. 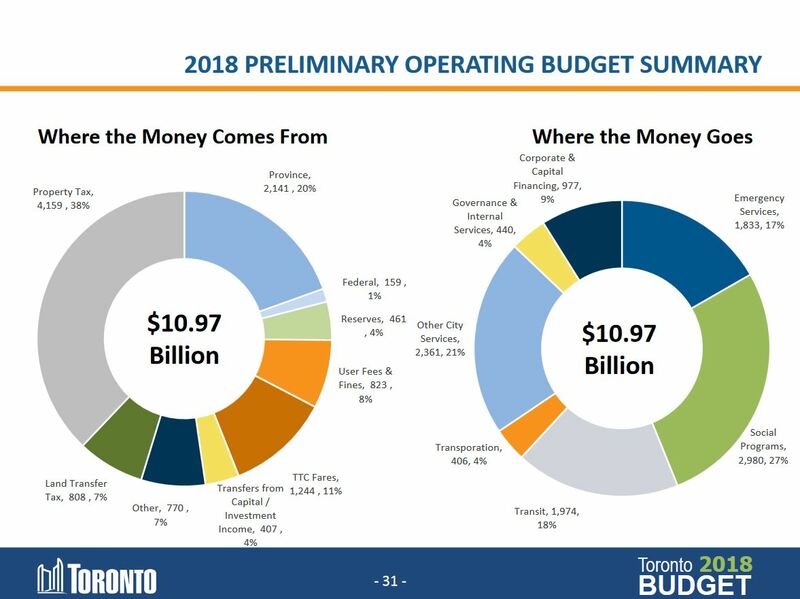 That $24 million pressure from the TTC (with more to come from unfunded proposals) crowds other City departments and agencies by taking the lion’s share of new spending. Among the factors listed in the revenue and expenditure changes for 2018 (p 27), there is a section headed “Prior Year Decisions”. 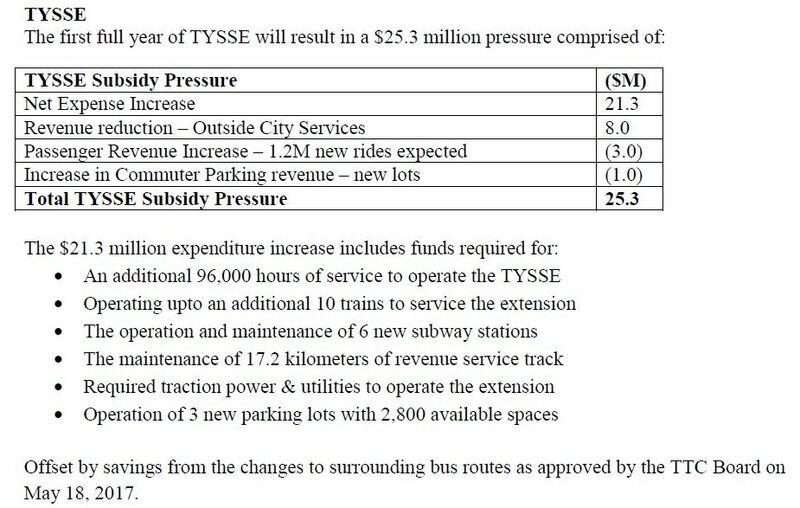 This includes the TYSSE effect, but does not include the cost of the fare freeze decision on the 2018 revenues. Had there been a fare increase, politicians would be forced to explain to riders how opening a new subway is not free and how York Region gets a free ride on Toronto taxpayers. When the available revenue including assessment growth and inflation in property taxes are considered, the City has a small surplus of $3.4 million in the preliminary budget. A further $5 million will be available from a pending change in taxation of vacant property, although Council has already directed that this go toward the Poverty Reduction Strategy. Without further adjustments, these are the only funds now available to pay for the $41 million in approved but unfunded initiatives including the Two Hour Transfer. On the Capital side, there are a few points worth noting in the City Budget that bear on the TTC’s funding. 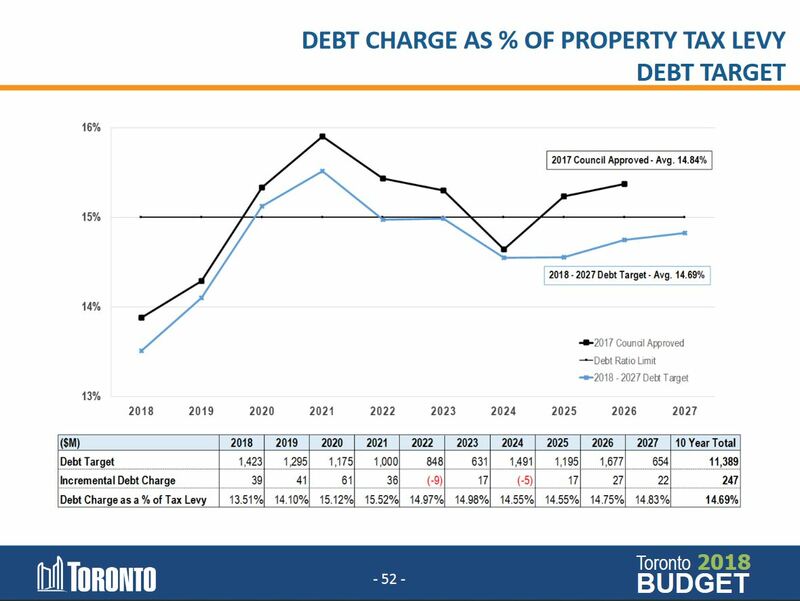 The City of Toronto has a policy that total debt service payments should not exceed 15% of property taxes. This was changed in recent years from a hard cap to one that considered the 10-year average debt ratio mainly to deal with a bulge in borrowing that will peak in 2021. That bulge would affect projections well into the next decade as lower-than-average borrowing in 2018-19 slips off of the chart but must be replaced by comparably low numbers in 2028 and beyond to hold down the average while the 2021 peak is “digested”. Various adjustments to the budget change the shape of this chart and somewhat tame the peak. 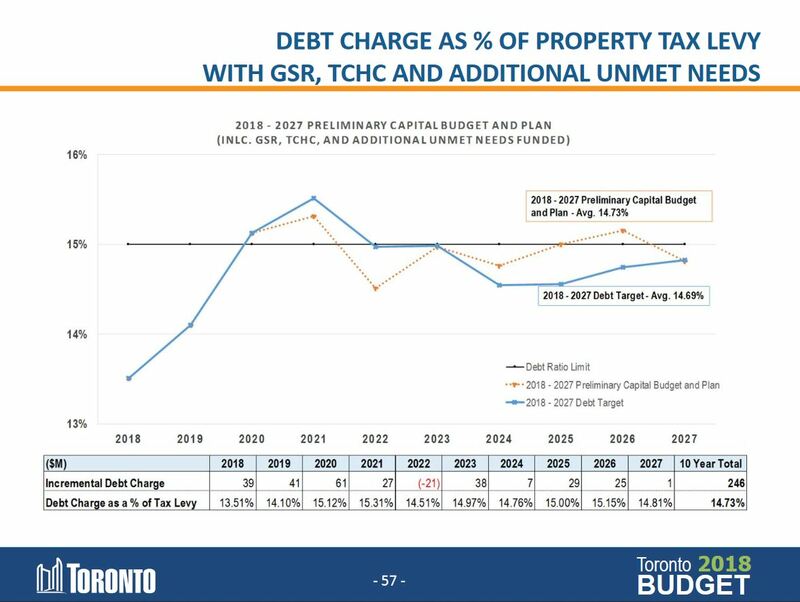 There are additions (funding for TCHC repairs and other unspecified “unmet needs”), but new provincial gas tax revenue announced in 2017 allows a reduction in the debt load producing the revised chart below. The debt limitation, together with limited provincial and federal funding, is directly responsible for the TTC’s enormous list of unfunded projects. The new gas tax revenue will generally not go to transit projects (except possibly under “unmet needs”), but will offset other City borrowing needs. Another change in projected City financing will be an increase in the “Capital from Current” amount. The proportion of funding provided by this source will rise from 12% of the 2018 budget to 22% in the ten year plan while debt falls from 32% to 22%. This will shift more of the spending in later years of the plan into the operating budget, although the dollar increase may be offset by a reduction in total annual funding needs assuming no major projects are added without dedicated revenue sources and/or subsidies from other governments. The budget presentations, which contain slightly different information from the budget reports, are now online. The Capital presentation has a more detailed breakdown of the “Capacity to Spend” reduction, and I have added this, plus a few comments, to that section of the main article (scroll down to the end). The PC Ontario Transit Platform: Real Change or Smoke & Mirrors? The Progressive Conservative Party of Ontario released its campaign platform that will take them into the 2018 election on November 25. This contains three pages on “Change that works for Transit Users”. How much of this voters will actually care about when the real headlines are tax breaks remains to be seen, but a review of these pledges is worthwhile to see what’s really involved and how it could affect transit in the GTHA. The concept of “Change” is hard to grasp when, in many cases, the Tories simply claim that they will do what the Liberals have planned all along anyhow. The platform implies that the Libs really don’t mean to carry through, but that the new gang, given the chance, will make sure all of the promised chickens actually turn up on every pot. Each of the bullets quoted below begins with the text “Patrick Brown and the Ontario PCs will …” as if Brown and his party were the government. L’état, c’est moi! This is precisely the sort of characterization for which the Liberals have been so rightly criticized. Note that this is the “existing commitments”, not any new ones, nor is there any guarantee of service frequency. Many cities longing for full GO service will stay right where they are looking down the track and hoping for more trains to appear. The words “GO RER” do not appear in the platform, no doubt because that is a Liberal program, and it incites the same reaction in the PCPO that “Transit City” did for former Mayor Ford. The Finch West LRT project is among those the Tories will complete, although there is no mention of the extension to Pearson Airport. By analogy to other items in the platform, this should really be a city project, not a provincial one because it is not a subway. The Hamilton LRT project is included, although some of the local Tories oppose it, and again this is not a subway. The portion of the Eglinton Crosstown LRT now under construction is not mentioned, nor is the planned extension westward to the airport. There is no mention of Waterfront transit which is mired in the “Reset” plan whose report has now been delayed to January 2018. Once upon a time, then Minister Murray “committed” that the sale of the LCBO lands on Queens Quay would go to transit, but that was long ago and commitments evaporate with a minister’s departure. This point strikes me as avoidance of derailing works that are some ways “down the track” without making any commitments beyond them. This bullet follows a long section of text which trots out some of the usual complaints, and cites Mayor Tory’s desire to get on with actual building rather than endless debate. “Shovels in the ground” is the aim, although this is selectively applied to subway projects: Scarborough, Sheppard East (Don Mills to STC), the Relief Line (unclear as to the short, medium or long versions) and the Richmond Hill extension of the Yonge subway. These are cited as “prime candidates for development”, but to that end, the Tories ante up only “an additional $5 billion” and are quite clear that they expect matching money from Ottawa. Ottawa already has an infrastructure program, although you would never know it from the Tories’ platform. The main questions here are how much of the national program is earmarked for Toronto, and will Ontario build new subways fast enough to qualify under that scheme. This brings us to the obvious point that new subways, with the possible exception of Scarborough’s, could only barely be under construction before the 2022 election, and there is no guarantee of the Tories being around to deliver on their “commitment”. Meanwhile, there are Liberal spending plans, although these are equally vague thanks in part to the dereliction by Metrolinx in giving any sense of priorities for, benefits of or costs related to the new Regional Transportation Plan’s components. The platform cites “the combination of insufficient capital, antiquated municipal accounting rules, and a lack of political leadership at the provincial level” for the long delays in provision of new transit. Physician heal thyself. Two decades ago, the Tories walked away from municipal transit, and the Liberals have been slow to return. Transit continues to be a contest among politicians that their one favoured project might be blessed rather than a collaborative effort to fund and build a network. The choice of projects is geographically skewed and omits large areas from the catchment of new lines. How the list addresses needs in the GTA overall is a mystery. 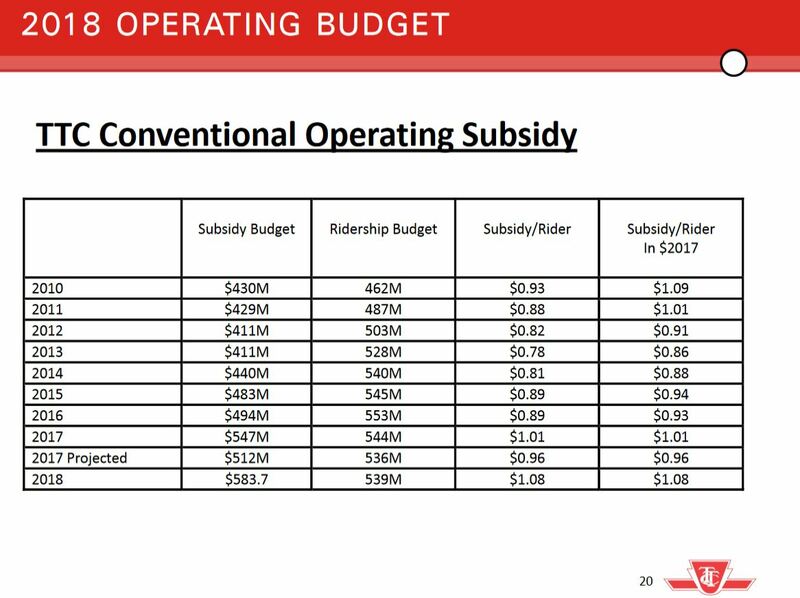 As for the $5 billion (or $10b if the feds come to the table), the first bite out of this will be consumed by the proposed provincial assumption of the Scarborough subway’s cost (see below), and whatever is left over will be used on other projects. That won’t get those tunnel borers very far, and certainly will not build all of the lines cited in the platform. As for those “antiquated municipal accounting rules”, possibly the PCPO could enlighten us as to how they would change these rules to free up additional spending capacity for cities across Ontario, not just in Toronto. Those rules exist to require cities to use a more [ahem] conservative set of accounting rules to ensure that they don’t get too deeply in debt, a constraint by which parties of all stripes at Queen’s Park are not subject. This is a truly bizarre statement because commuters across the GTA depend on far more than the Toronto subway system to get them to work. Indeed, Toronto shells out considerable dollars through operating and capital subsidies to keep what is really a regional asset operating. The portion of the Vaughan extension north of Steeles will add about $10 million to Toronto’s annual costs with almost no return via new fare revenue or subsidy from York Region. Making Ontario responsible for “maintenance and investments” would certainly be welcome as an upload, but this would be a very large new cost for Queen’s Park. As I discussed in a previous article, the subway system accounts for about a third of the TTC’s Operating Budget and about half of the Capital Budget. Net of provincial contributions Ontario already pays (gas tax), this would leave Queen’s Park with about $1 billion in new annual costs just to keep the existing system running, and no offsetting revenue because the platform commits to leaving all of the fares in Toronto. Part of Queen’s Park’s new responsibility would involve the greater use of private sector design-build-finance-maintain contracts which, the platform claims, would accelerate the rate of construction on new lines. This would also, as the Provincial Auditor has complained, add to cost and create the need to manage contracts that would not exist if the assets were kept in house. This is part of the creative accounting we have seen under the Liberals and clearly favoured by the Conservatives which converts traditional debt to a long term lease arrangement with the physical property (i.e. a new subway line) as an offsetting asset. Presto! The provincial debt stays down, even though there is an unavoidable long term payment commitment. The platform states that the government “will assume responsibility for the physical subway infrastructure – tracks, tunnels and stations”, although there is more to infrastructure (notably vehicles, yards and shops) than this list. The TTC would remain as the operator/maintainer under contract, and fare revenue would stay with Toronto. I will return to the issue of fares later. This would be done “in partnership with the Mayor of Toronto”. It may have escaped the Tories that such agreements are made with the City of Toronto through Council, not the Mayor’s office. The existing subway system is an asset of the city paid for with municipal, provincial and federal dollars. It is one thing to assume the cost of routine and capital maintenance and operations, but quite another to transfer the asset to the province merely to suit accounting trickery, or worse, to enable future resale. All of this is intended to “create a structure that takes advantage of the province’s balance sheet to maximize provincial investments”. That goobledygook brings us back to provincial accounting rules and debt transformed into DBFM contracts. Would it be churlish of me to point out how often the PCPO has pilloried the Liberals for creative accounting? This is all explained as a regional benefit through co-ordinated planning, ensuring that Toronto gets long-awaited subways, relieving commute times across the GTA and increasing economic growth while reducing red tape and arbitrary delays. This is pure doctrinaire BS. Commute times might improve, but mainly for riders in certain sections of Toronto and central York Region, not “across the GTA”. We do not suffer from an excess of red tape, but of the lack of will to spend region-wide on transit. In the middle of a discussion of new subway lines, this bullet appears. In that text “subway stations that it builds” actually refers to the province even though the text could imply that they are built by the city. This idea appears out of nowhere as if somehow the housing crisis will be solved by building over subway stations. In fact, only one future station, the one at Scarborough Town Centre, is even in the pipeline, and development around it is already planned. If the Tories were serious about this policy, they would turn their attention to existing stations throughout the network, including the GO stations now surrounded by parking lots. The eventual cost of the SSE is an unknown quantity today, and if anything is subject to increase beyond mere inflation as detailed design proceeds. It is standard practice for Queen’s Park and Ottawa to cap their contributions at a fixed value for municipal projects, although Ontario is happy to quote its own projects with a base price plus an unspecified allowance for inflation. This allows the province to low-ball its cost estimates by quoting 2020 work in 2010 dollars. Capping contributions is done specifically to avoid scope creep where municipal plans expand by spending “thirty-three cent dollars”. For example, all of the cost overrun on the Vaughan extension has been funded by Toronto and York Region under their cost sharing agreement with no extra money coming from other levels of government. A provincial commitment to paying the city’s share of the SSE is like writing a blank cheque so that any design problem can be solved just by sending the bill to Uncle Patrick up at the Pink Palace. As for the LRT line to UTSC, this was originally part of the consolidated “plan” for Scarborough transit, the deal that convinced subway opponents to buy in because the LRT sweetened the pot. All the money, of course, is now dedicated to the subway extension. It is unclear just what the platform means by a “significant contribution” from Toronto, nor where the remainder might come from for this project. Yes. Of course. It’s an Ontario program but someone else should help to pay. A nice 50-50 split to spread the load around just as some federal programs like PTIF assume that others will help to pick up the bill. Given that the Tories’ “commitment” is rather small (especially once the SSE takes its share), Ottawa should have little problem matching it. The real problem will be waiting to see whether any of the projects advances far enough to draw on funding from any government. … customer service levels on the GO train lines are not up to par. The government should focus on getting transit built, but it should also focus on making commuting a better experience. When I read “promises” like this, I have to wonder how they get into platforms, and whether every post-it note from policy conferences simply was swept up from the floor. Without question, there are customer service and friendliness issues at Ontario’s transit systems (plural), but WIFI on GO is hardly the place to begin addressing this. At no point does the platform address any increase in service beyond that already in the GO RER plans, nor is there any “commitment” to improved funding to encourage the buildup of local transit on which all of these new GO services will depend for “last mile” access. More “customer friendliness” including fare “harmonization”, although there is no description of just what this might mean. Online ticket purchases are already possible with Presto, and that system is used in much of the GTHA thanks to the heavy hand of Queen’s Park. “Forms of payment” is a rather broad term that takes us all the way from the simplest of Smart cards up to bank cards and mobile apps. The real issue with “ticketing” is a harmonized back end system that can handle multiple ways a rider might identify themselves and charge rides to their account. This item has the feel of a platform written by someone who rarely uses transit. That and a few billion will get you a somewhat faster train to London and beyond, but don’t hold your breath. The High Speed Rail project (and a kindred boondoggle, the Hydrogen Train) are great exercises in appearing to be doing something while “committing” to schemes that are either unaffordable or technologically immature. This “commitment” simply avoids the Tories looking like they oppose HSR without actually making any plans to built it. A much more useful platform, from any party, would be a wider discussion of passenger rail and bus services, and not just in southern Ontario. However, the Tories have written off transit in all but a few markets. The next section of the platform is entitled “Change that works for Drivers”, and it is a screed against the evils inflicted on motorists by the Wynne government. Oddly, it is less than half the length of the transit section, although clearly the Tories are playing to the idea that too much attention goes to transit riders and projects. Overall, the PCPO platform share with all such documents a certain lack of editorial rigour having been pieced together from a variety of proposals originating in multiple policy conferences. Some were accepted, some were modified and some were rejected – the result has a stitched-together feel and an assumption that most people will only read the sections they care about. Such is political life. The “money” platform is always key and, as usual, voters will be bribed from their own pocketbooks. How much of the transit platform will actually be implemented once the complexities and costs become evident? That is quite another question. My thoughts on Andy Byford’s term as TTC’s CEO and his departure for New York City are over on The Torontoist website. Mayor Tory, TTC Chair Josh Colle and TTC Commissioner Mary Fragedakis have requested that TTC staff report later this month on the “costs and any other implications for the introduction of time-based transfers for PRESTO users” in 2018. This would make the single fare a payment for a limited-time pass rather than for an unbroken trip subject to transfer rules that predate the TTC’s origin nearly a century ago. This proposal is pitched both as a way of assisting low-income riders (for whom multiple short trips by transit can be quite expensive) and local businesses (who would benefit from the hop-off, hop-on behaviour), as well as a way to reduce fare evasion whose cost is pegged at about $15 million annually. The more cynical among us would note that the change simply makes “legal” a behaviour TTC riders have engaged in since the dawn of time – maximizing the amount of travel possible for one fare. The Presto smart card’s operation would be greatly simplified with the elimination of the byzantine logic required to validate transfers between vehicles, and it would also remove the source of many disputes about overcharges when Presto does not recognize a change of vehicles as a legitimate part of a continuous trip. This would also make fare integration across the 416-905 border simpler by unifying TTC transfer policies with those of the local 905 systems. What remains is the need for a funding mechanism to provide a co-fare arrangement between operators. This is a surprising reversal for Tory and Colle who, in past years, treated the time-based fare as “too expensive” despite its many advantages. Previous estimates pegged this at a $20 million annual cost. With CEO Andy Byford showing strong support for this policy as part of a Ridership Growth Strategy, the move is clearly on to make this change. The timing for the election year is an extra benefit for politicians looking for a transit improvement. Now if only they would fund better service. This should be the final nail in the coffin for the ill-conceived Metrolinx proposal to shift transit fares to a distance-based charge. With all of the GTA operating on a time-based system, and zones vanishing internally (York) and between regions (cross border fare sharing), there is zero justification for a wholesale upheaval in a flat fare arrangement. Metrolinx should wake up and drop this from its policy proposals. The Board will also receive a presentation on the Metrolinx Draft Regional Transportation Plan. If there are any new developments on this front at the meeting, I will report on them in an update to this article. The Ridership Growth Strategy. This has been repeatedly promised, but not delivered. 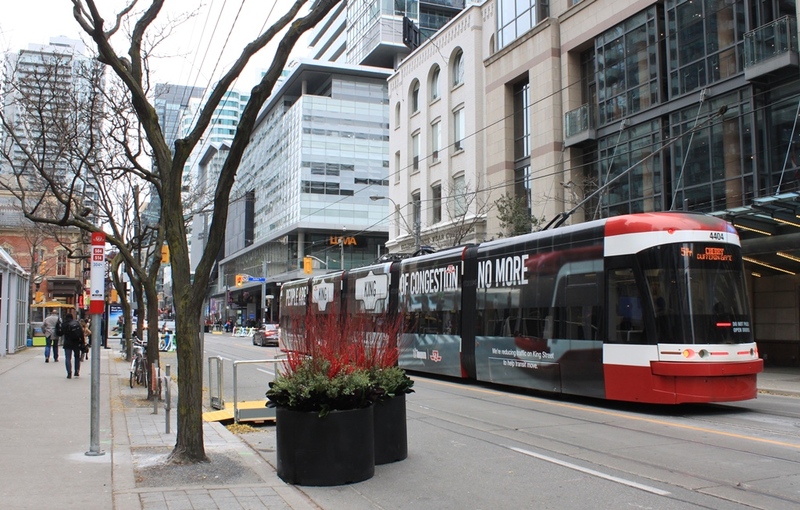 I spoke with Andy Byford at an event launching the King Street Pilot on November 9 and asked about this project. He advised that there would be an interim report at the December Board meeting setting out a work plan to verify that the strategies staff are looking at line up with what the Board actually wants to study. Then there would be a separate report or reports in 2018 with specifics of implementation. He reiterated past comments that the plan would be very “aggressive”. Note that a few RGS-related changes are listed in the 2015 Service Improvements Review, although they lack funding. The Bloor-Danforth line renewal plan. This plan will address the need for a new fleet in the 2020s, a new carhouse, resignalling and conversion to automated operation, station upgrades, and any other work that reasonably fits in a package where a unified, co-ordinated approach will reduce overall project costs. The only problem is that Toronto has no funding for most of this. A related issue is that some work, notably a fleet capable of automated operation, will likely be needed for the Scarborough Subway Extension planned to open in the mid-2020s. Byford believes that this report will be coming to the Board in early 2018.